Who do you consider a strong woman in Elizabeth Gaskell’s story? I immediately think of Margaret Hale and Hannah Thornton for their amazing ability to endure whatever life throws at them. Edith, Fanny, and Aunt Shaw are models of the more fashionable and useless Victorian woman — living a coddled life of vanity where problems must be invented in order to have something to complain about. Weaker women tend to complain a lot, they’re often unable to make decisions for themselves, they can’t cope with stress or tragedy, and they hardly bother to think of how situations or events affects others — they’re too consumed with their own concerns or wants. Weaker women let society and fashion mold them. In contrast, strong women keep their complaints mostly to themselves, make decisions without consulting others, handle stress and tragedies without shutting down, and most importantly — they think of how their actions affects others. Strong women create their own path in life. Of course, we all have our weak moments (or days or years), and I’m not saying that Margaret is always strong. On the contrary, she has her breakdowns — although they are kept very private. She’s human and she cries and complains at times. But she keeps moving forward, despite all that happens to her. That’s a quite a lot to muddle through before you turn twenty-one. And throughout it all, Margaret maintains a remarkably strong sense of her identity and worth. She does not let others define her. She makes some courageous decisions and she accepts responsibility for following through. She’s the backbone of the family. In so many ways, Hannah Thornton is like Margaret. She suffers her hardships silently, takes decisive action when things get really hard, and does what it takes to keep her family going. The fact that Hannah didn’t wait around for charity or accept the stigma society placed on her family for her husband’s suicide tells you tons about this woman. She laid the foundation for John’s success, which required her to take a determined path centered on her own values, not the ones society laid out for her. For a dying teenager, Bessy keeps her complaints to a minimum (how many teenagers do that?!) and doesn’t make a lot of drama. Even during her last dying days, she’s worried about her father and distressed about how her father is treating Boucher. She isn’t focused on her own condition or terrorized by it. Her passionate desire to calm her father is stronger than her own self-concern. Her last words to Mary are for her to keep her father from drinking. Clearly, she had a strong love for others. Bessy’s younger sister stays in the periphery of the story, but she is a silent strength in her own right. There’s no indication that Mary is a troublesome or selfish girl. She works to contribute to the family and tries to be helpful. After Boucher’s death, Mary takes care of his children. Mary is actually the main breadwinner of the family while Nicholas is out of work. I had no intention of including Maria when I set out to write a piece about strong women. I’ve never been a fan of Maria; I have practice being very critical of her. When we first meet her in the book, she is small-minded, self-pitying, and a rather vocal complainer. I tried to think if she had any strengths, and had an epiphany of sorts in realizing that she did. How did I miss it all these years? I had never really stopped to consider why—after years of making a habit of complaining—she suddenly keeps her serious illness a secret. She must have made this decision out of love for her husband, knowing it would be a terrible blow to him. She didn’t want to distress her family with this trouble, so she kept her physical suffering to herself (and Dixon) as long as possible. I find her motive in doing this very noble. Whether or not her decision was wise or not, it demonstrated strong desire and self-control to protect others from emotional pain. And so I have a new appreciation for Maria that I had not had before. She showed her strength in the end. What strengths do you admire in the women of North and South? My stories have occasionally been criticized for making too much of the physical dynamics between John Thornton and Margaret Hale. Perhaps they do, but I take my cues from Elizabeth Gaskell's own writing, which conveys a tremendous amount of physical emphasis when describing Margaret's effect on John Thornton. From John's very first encounter with Margaret in that hotel sitting-room, Gaskell makes clear that Thornton is completely discombobulated. Margaret's presence does things to him. Physical things. Things that affect his ability to coordinate and control his own body. He finds it hard to formulate complete sentences, he cannot stop staring at her, and when he leaves "he [feels] more awkward and self-conscious in every limb than he [ever had] in all his life before." And that's just the first meeting. We haven't even begun to talk about what effect actually touching Margaret will do to the poor man! He shook hands with Margaret. He knew it was the first time their hands had met, though she was perfectly unconscious of the fact. He must remember, as we do, how hurt he was when she did not shake his hand when he came for tea. Shaking her hand now must feel like a small victory. It's far more than a mere social formality to him. It's apparently something he's been longing to do -- touch her. The mini-series makes this moment -- this first touch between future lovers -- sizzle with a sexual tension that makes a Victorian handshake more passionate than most modern kissing scenes. And this spark of longing portrayed in the film -- at least on Thornton's side -- is perfectly matched by Gaskell's prose. Thornton spends the rest of that evening acutely aware of where she is and who she is talking to. There's definitely a strong attraction going on, which Margaret is not aware of. 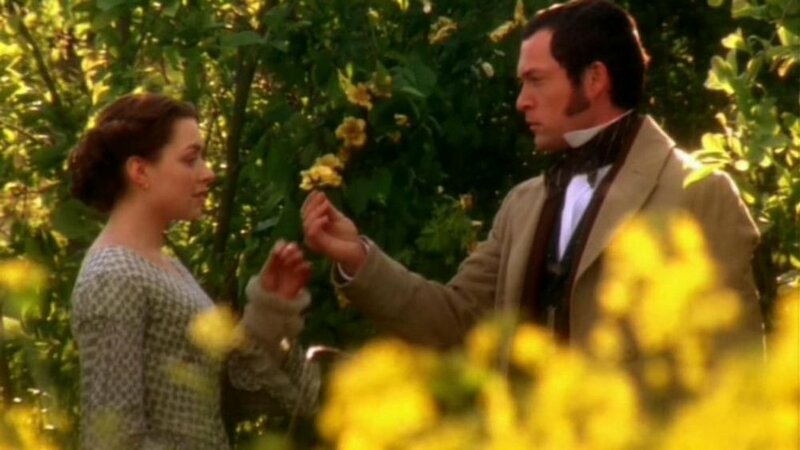 Far beyond a social handshake, Gaskell multiplies the physical contact a hundredfold when she has Margaret throw her arms around Thornton in a body-to-body embrace -- a shockingly intimate gesture. Granted, Margaret does this out of pure terror for his life, in front of a frenzied crowd -- hardly the sweet, loving gesture John may be dreaming of, but that doesn't in the least change the enormously powerful effect that one brief moment of intimacy has on Thornton. He can't stop thinking about what she did, how she wrapped her arms around her neck, how her body was pressed next to his ... he's fairly consumed with the longing to feel her in his arms again! "All the blood in his body seemed to rush inwards to his heart as he spoke, and he absolutely trembled." "He went away as if weights were tied to every limb that bore him from her." "Every pulse beat in him as he remembered how she had come down and places herself in foremost danger.... He went to his Irish people, with every nerve in his body thrilling at the thought of her ..."
Where does all this explosive passion come from? In large part, from loneliness and years of keeping his emotions mostly hidden. His mother is his closest confident, yet we know she is not exactly the warm and fuzzy type to give out hugs and listen to all your troubles. If you really think about it, when was the last time this man was hugged? When has he last felt the warm affection of a heartfelt embrace? I'm guessing he hasn't felt human touch like that in years. But clearly it's not just human touch he's longing for. 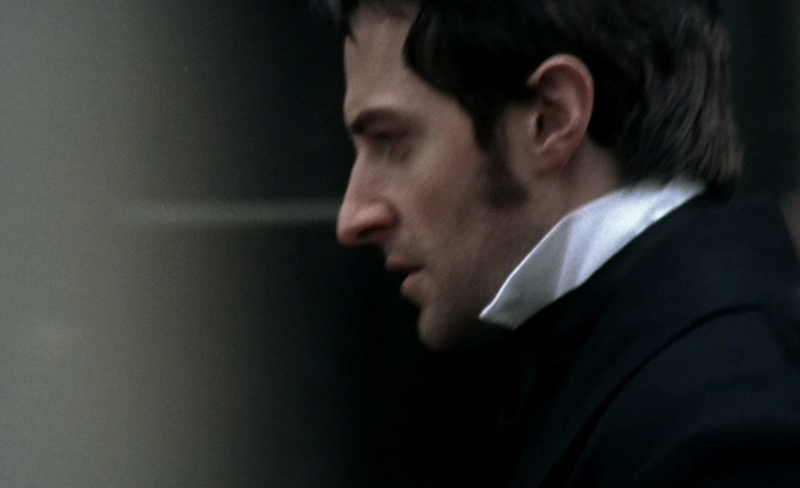 John Thornton's frenzied longing is not commonplace lust. It's truly a longing to love and be loved in return. And it's Margaret that has brought out his strong passion. He sees in her an inner strength, independence, intelligence, and deep devotion to others that matches his own. His feelings for her have been silently accumulating. Her frantic embrace of him is the touchstone that releases all his repressed passion. It's as if this moment of intimate human connection has lit a fire inside him. Now he sees -- his body has felt for a brief, sensuous moment of time -- what could be. And he wants that close relationship with Margaret desperately. Gaskell draws a very sensual image by having Margaret cling to Thornton. How many other romantic heroes get a taste of physical intimacy before they ever even declare their feelings? It's a touch that Thornton never forgets the thrill of. It reverberates through his whole being. It's hardly any wonder, then, that at the end of the book the first thing he does after they become a couple is to take her arms and place them around his neck -- just as he remembered she had done. Just as he had ached for so long for her to willingly do again. Margaret Hale cries. A lot. Well, not in the BBC mini-series so much, but she cries an awful lot in Gaskell's book. Did you realize that? I knew there was much more lacrimal action going on in the book than the film ever portrays, but even I was surprised by my research on the subject. She cries 31 times. Yes, I read the whole book and counted. Stay tuned, because a little later I'll be analyzing why and when Margaret Hale sheds tears throughout her trials in North and South. Complete with graphs and all. And now you know how serious my North and South affliction is. But I'll assume that if you're reading this, you must have somewhat of a thing for North and South, too. What difference does it make whether Margaret cries or not? Let me tell you why I bothered to count her crying moments in the first place. From the wide variety of comments, reviews, and summaries regarding North and South I've read over the years, I've regularly come across a strain of viewers/readers that tend to envision Margaret as the embodiment of more modern heroic ideals of feminine confidence and independence. This version of Margaret is always able to handle whatever comes her way, seldom or never breaks down, needs little or no aid from others, carves her own path in life, and seems always ready to give a piece of her mind to those who don't see the world as she does. And this view of an ever-strong and capable Margaret Hale is given a boost by the BBC's portrayal of Margaret, where we seldom see her at her most vulnerable moments. The 2004 mini-series conveniently avoids showing an unconscious Margaret being carried into the Thorntons' house. The adaptation also omits Margaret's collapse into unconsciousness following the intense questioning of the police inspector. We see Margaret cry once throughout the entire film version -- at her mother's death. Clearly, Margaret is made of pretty stern stuff. She seldom appears to lose control. .... to here? The 2004 BBC adaptation will let you guess. The 1975 adaptation doesn't skip over this very vulnerable moment. The essential question we should ask is whether Margaret can be considered a model of strength despite the fact that she cries at times. Is crying a sign of weakness? Is it an embarrassing symbol of feminine sensitivity? Of incapacity or immaturity? Crying can become excessive and indicate shrinking fear, self-pity, or over-sensitivity that is not admirable. But if crying is something of an emotional release valve for those going through deep trials, then crying is wholly human; it indicates that we actually have a heart--which is a good thing. I'd be more wary of someone who doesn't cry in moments of extreme emotional anguish, grief, or despairing exhaustion. At the very least, we know that with all the crying going on, Margaret Hale indeed does have a heart -- even if she keeps it very well hidden from brooding cotton mill masters. In my curiosity to see how many times Margaret cried, I marked each instance down and jotted a little note. Of course, categorizing and counting cries is hardly an objective task. What counts as a cry in my analysis? I counted not only clearly described sobbing and wet cheeks, but also when tears welled up and one instance in particular when she was "choking and swallowing" to fight back tears. Why she cried was also my subjective judgement. I endeavored to interpret the reason she cried from the immediate procuring cause and any underlying cause that I perceived lurked behind the tears. We all cry for compounded reasons, but I tried to classify the predominant factor. For example, when Thornton comes to offer his condolences after her mother's death, he speaks so tenderly that he evokes tears from her. Is this a cry because of her mother's death or because his gentleness reminds her of her lost chances (she thinks) with him? I marked this cry as one caused by grief since it so closely followed the loss of her mother. Now let's take a look at my categorization for why Margaret Hale shed tears throughout her three year trial in North and South. The most shocking revelation from the above graph is that despite all the other reasons for crying: being ripped away from a beloved home, dealing with multiple deaths and unending family trials -- it's her strong feelings concerning John Thornton that's the number one reason she loses control of her emotions in the novel. She cries after Mrs. Thornton comes to chew her out, she cries when she confesses to her father that she rejected Thornton, and she cries when she explains to Mr. Bell what Mr. Thornton must think of her. And now for a very general overview of when Margaret cries throughout the story. There's not much surprise here. Margaret's problems started with that fatal day when Henry proposed and her father told her they were moving -- her trials only accumulated and intensified from there. After the proposal, just about every thing in her life is falling apart. Thornton's declaration of love is a reverberating climax, and it also conveniently marks the halfway point of the novel. It's not really a surprise that Margaret gets twice as tearful in the second half of this story because that's precisely when her troubles begin to compound and things get complicated. You can look at this graph also as a division of the BBC mini-series. Episodes 1 and 2 constitute the first half and episodes 3 and 4 follow the climactic midpoint: Thornton's proposal. And seriously, wouldn't you cry too if you declined Richard Armitage/John Thornton's offer of eternal devotion?! So, back to my essential question -- can Margaret still be considered a admirable bastion of strength, even with all her moments of weeping and tear-filled eyes? You bet she can! Her emotional strength is impressive considering her age and the situations she is forced to deal with. How well would you hold up if you had to juggle fulfilling your mother's dying wish, preventing your father from slipping into depression, making maneuvers to keep your brother from dying a traitor's death while at the same time inadvertently screwing up your relationship with the man of your dreams? Oh, and your best friend dies about the same time as your mother. Good times, right? Ability to keep moving/acting even when some days you are just surviving instead of moving forward. The ability to keep going when everything seems to be falling apart. Not succumbing to despair, bitterness. Determination of individual purpose -- you define what you're living for. Ability to put personal pleasure and ease aside in the endeavor to follow your ideals. Rising to the occasion when others are incapable of leading. Persisting in endeavoring to do what is right. Do strong women cry? They certainly do. The film world's most romantic kiss. The best love stories involve a fierce devotion and fidelity that suffer through time and agonizing circumstances. This is certainly the case for John Thornton and Margaret Hale. But what would have happened if Margaret and John had never cleared up the misunderstandings that kept them apart? What if they had never met at the train station (or in that back drawing room at Harley Street)? Would they have eventually settled into a mature complacency and have settled down to marry someone else? All my romantic sensitivities scream "NO!" Fortunately, I can find plenty of contextual evidence to support my emotional response. So why do I believe John and Margaret's love for each other would inspire a lifetime of devotion? Because for both of these passionate introverts, falling in love was a once-in-a-lifetime event that ran very deep. From the moment he meets Margaret, John is tongue-tied and dazed (see my post about this first encounter here). He's somewhere around thirty years old and he has never felt such a powerful attraction to a woman before. He's completely blindsided by the whole experience of falling in love; which throws him into a vortex of emotions that are entirely beyond his normal self-control. Falling for Margaret appears to entirely upend his regulated mental world. Before Margaret, marriage was not on John Thornton's mind. From what he quips to his mother, the most eligible man in Milton doesn't even appear to be aware that women have been angling for him for years. "I never was aware of any young lady trying to catch me yet, nor do I believe that any one has ever given themselves that useless trouble." Was he really that clueless?! Apparently so. It's rather painfully clear that John Thornton was not making the social rounds looking for a bride. And he doesn't seem to have any intimate friends either. He's busy. And he keeps to himself for the most part. He and his mother -- his closest companion -- don't share their deepest thoughts and feelings with one another. Margaret ... you are the only woman I ever loved! I have never loved any woman before: my life has been too busy, my thought too much absorbed with other things. Now I love, and will love. It's an all-consuming love for John. He doesn't dabble in cotton; he doesn't dabble in love. It's all or nothing for him. Poor John is devastated by her rejection of him, and he's absolutely tortured by the thought of her being in love with another man. Even five months after his rejection, he discovers that his passionate feelings are wildly out of control. ....the very sight of that face and form, the very sounds of that voice....had such power to move him from his balance. Well! He had known what love was -- a sharp pang, a fierce experience, in the midst of whose flames he was struggling! but, through that furnace he would fight his way out into the serenity of middle age, -- all the richer and more human for having known this great passion. It's this stunning quote from the book that reveals how deeply he feels this connection to Margaret. He considers it foundational, transformative. He expects the effect of this singular powerful devotion to continue to reverberate throughout his life. I don't think there's a chance he'll marry anyone else. One of the most striking differences between Margaret and girls like Edith and Fanny is how little Margaret's mind is occupied in finding a husband. For a girl of marriageable age in that era, it's rather startling that it doesn't even seem to occur to her to consider Henry as a possible match. She's not thinking of Henry that way because she doesn't have any romantic feelings for him. And she refuses him because she cannot reciprocate his ardor. Margaret expects to marry for love (see my post here). She believes that when a man asks a woman to marry him, it should be "the deepest, holiest proposal of his life." Margaret is no flighty, flirtatious girl looking for the most comfortable option in life. She cannot accept his proposal because "her instinct had made anything but a refusal impossible." Her heart is not in it. Although Margaret's journey to a deep-held devotion takes much more time to develop, the impact on her is still very powerful. She's attracted to John's strength, integrity, and honesty. And his passion for her, once communicated, frightens and fascinates her. By the time she fully realizes that she's in love with him, she cannot control her strong feelings and obsessive attraction any more than he can. Some time, if I live to be an old woman, I may sit over the fire, and looking into the embers, see the life that might have been. Poor Margaret also doesn't have anyone to truly open up to in her despair. She, like John, keeps her emotions hidden from those around her. This solitary struggle makes the longing for each other even more intense. They are both desperate for that intimate connection -- to find an emotional home where they can love and be loved without repression. Even after he declares that his foolish passion for her is over, she cannot stop thinking of him. At present it seemed to her as if all subjects tended towards Mr. Thornton; as if she could not forget him with all her endeavors. She can't stop thinking of him when Mr. Bell takes her to Helstone many months later. And she can't stop thinking about him back in London. Henry is never an option. And when Edith talks about finding her a match, Margaret tells her "I shall never marry." She knows her heart belongs to another, and she will not live a lie by marrying anyone else. Thank goodness for Mr. Bell's inheritance and Margaret's determination to help John in his business failure! It's a great relief to see these two love-sick creatures finally make those first sweet, intimate gestures that hint at the strong bond of love that has long been formed between them. It's perfectly natural to expect proud, independent heroines to be vehemently resolute in their judgements. After all, the girls who slide into compliance with traditional expectations and customs would hardly make an exciting story. But boy do Gaskell's girls create a ton of trouble for themselves when they pour on the stubborn resistance to the magnetic pull of Mr. Destiny! I'm finding many parallels between Margaret Hale and Mary Barton, but what's most striking to me is how similarly they must struggle to find a way to make restitution for a monumental mistake: rejecting the best offer of marriage they'll ever receive. 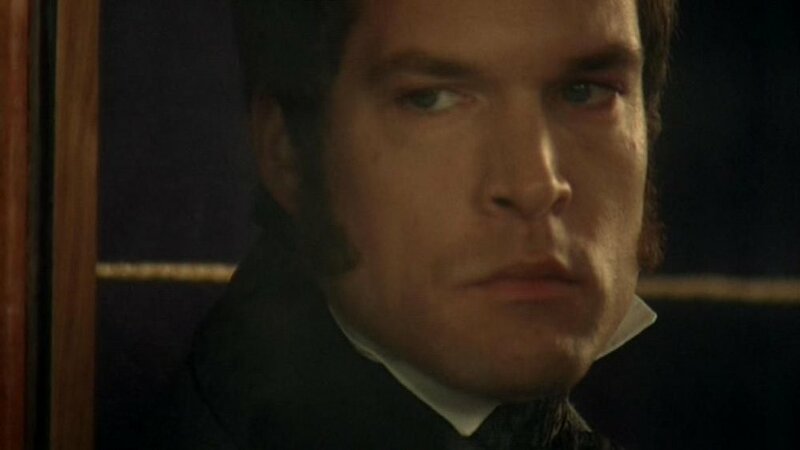 The look you get when you've just rejected the violently passionate Mr Thornton! Both Mary and Margaret have predetermined to hold themselves superior to the men who desperately want to marry them. They both receive wildly passionate speeches of undying love. (I just love the sweet and fervent proposal in Mary Barton!) And each of these girls find themselves powerfully shaken by the intense interaction. Their hearts are jostled open by the honesty and fervency of the devotion expressed by the amazing specimen of a man they just turned down. Of course, both these hard-headed ladies have aha moments about the hero and their own feelings -- but they're just too dang late! The aftermath of each of these feisty decisions isn't pretty. So what do you get for turning down the best man in town? The wrath of Mrs. Thornton unleashed on Margaret. Maidenly modesty ... seemed to oppose every plan she could think of, for showing Jem how much she repented her decision against him, and how dearly she had now discovered that she loved him. She came to the unusual wisdom of resolving to do nothing, but strive to be patient, and improve circumstances as they might turn up ... She had been very wrong, but now she would endeavor to do right, and have womanly patience, until he saw her changed and repentant mind in natural actions. This explains Margaret perfectly! We see her doing exactly this -- humbly trying to show her repentance by her demeanor in every interaction with Thornton. But her tongue is tied as a woman of that era. A good Victorian girl could not approach a man to explain herself. She is forced by propriety to wait until the man initiates any further communication concerning the subject. How torturous it must have be for these passionate and bold heroines to repress the expression of their thoughts and feelings! The suffering lasts two years for Margaret. Two years of misunderstanding and the repression of deep-held emotions because the moral culture of the day does not allow her to express herself. And two years that Thornton must also suffer in believing she doesn't care for him. For Mary Barton, the suffering is loaded with imminent danger, but only endures for a short span of time. Her beloved almost loses his life because of her rejection! Ah, but love prevails in the end. Happy endings are hard-wrought in Gaskell's tales. And both of Mary and Margaret play an active and unconventional role in "saving" their respective Mr. Right. After all the heartache they have caused, these girls are able to make full restitution for their catastrophic mistake. And tell me, who wouldn't suffer two years, three years, or even ten to earn Mr. Thornton?! He truly is -- in so many ways -- Mr. Right. Elizabeth Gaskell begins her novel with one wedding and ends it with the imminent prospect of another. In the opening pages, eighteen year-old Margaret Hale is caught up in the flurry of preparations for Edith's forthcoming wedding. And by the end of chapter two, Gaskell has depicted the general outcome of two marriages (the Shaws and the Hales). Clearly, Gaskell has something to say on the subject of choosing a life match. And well she should, since her heroine has arrived at the threshold of the marriage mart and will need to navigate her way through two unexpected proposals and the possibility of spinsterhood. Should one marry for money or love? This appears to be the rather stark choice presented to every Victorian girl. Gaskell gives us a glimpse into the result of both choices by comparing two sisters. 'Married for love, what can dearest Maria have to wish for in this world?' Mrs. Hale, if she spoke truth, might have answered with a ready-made list, ' a silver-gray glacé silk, a white chip bonnet, oh! dozens of things...."
Mrs. Hale married for love, but has found it difficult to be happy with the modest income and somewhat isolated life of a country parson's wife. She complains that her husband hasn't risen to a more profitable and socially satisfying position. Gaskell doesn't present a clear winner out of either of these two marriages. Is there any hope that her protagonist, Margaret Hale, will find some kind of happily-ever-after? How should she choose a life partner? The answer may lie in looking a little closer at what "marrying for love" may mean in different cases. Mr Hale and his wife may have been in love, but they don't seem well suited to each other on an intellectual level. Gaskell points out that early on in their marriage, Mr Hale wanted to spend time reading aloud to his wife but that she was annoyed with it. Thus, he began to retreat to his study and read alone. So, in finding a good match, it's best to match both hearts and minds. It's important to find someone who engages your mind and enjoys similar pursuits or you may find your marital bond weakening instead of strengthening. Henry Lennox gets a "no" from Margaret. Margaret's rejection of Henry Lennox tells us much about what she expects, consciously or unconsciously, from marriage. When Henry asks if he may still hope that she may someday accept him as a lover, she is "silent for a minute or two, trying to discover the truth as it was in her own heart." Ultimately, she couldn't say "yes" when her heart said "no." She clearly intends to marry for love. Henry is a good catch for her, according to the prevalent assumptions of what a girl should aim for, yet she wasn't at all tempted to accept. Marriage isn't even on Margaret's mind at the time Henry proposes. She doesn't seem to be worried about who or when she'll marry at all. She's just happy to return to her home in Helstone. Securing a comfortable position as someone's wife isn't on her current agenda. Someone else in this story also doesn't appear to be thinking about finding a spouse: John Thornton. He hasn't been making any plans or showing any interest in the ladies that his mother says are pursuing him. What are John's expectations of marriage? There's no indication that he had planned on marrying at all. He has been too occupied with his work. What was the model of marriage his parents left for him? We can only surmise that Hannah Thornton may have loved her husband, however much pain his suicide caused her. She wears black, the color of mourning, years after first becoming a widow. She has kept with pride the Dutch damask napkins with her husband's initials, given as a wedding present, through all the years of hardship. She never speaks unkindly of him or seems to blame him with bitterness. If it's possible, then, that Thornton recalls his parents' marriage as one based on real affection, then it's certain that Fanny was too young to remember anything of her mother's marriage at all. Fanny doesn't appear to have any other aim than to marry well according to social status and wealth. She, like Aunt Shaw, chooses to marry a rich, older man. It's fascinating to watch how Margaret and John discover that they have found someone that they want to marry -- someone who engages their heart and their mind -- when marriage had been the furthest thing from their minds! John Thornton also gets a "no." It's a rocky road to love. Margaret is compelled to say "no" to the second offer of love she receives because she isn't aware that she is falling in love with the Milton master yet. Too much confusion. And by the end of the novel, when Margaret tells Edith she will never marry, the reader knows it's because she will not compromise on marriage. She will marry for love, or not at all. And she believes that the door to marital bliss has been closed forever for her. When do John and Margaret Stop Arguing? The BBC's John Thornton tries to recover from Margaret's rejection. No, this isn't a trick question. There's a definite end to their arguing in the book. And you may be surprised at the answer. When John comes to declare his love for Margaret the morning after the riot, the tense relationship between the master and the Milton newcomer reaches a blistering vocal climax. Pent-up emotions on each side explode into forceful words and both are left stunned by the unexpected vehemence of their exchange. Margaret is temporarily immobilized after Thornton's departure. After this staggering tempest, the dynamic between these two strong-minded individuals is forever changed. After this day, Margaret never again raises her voice to argue against him. In fact, the very next day she finds herself defending Thornton to a grieving and bitter Higgins. The end of the verbal battles between Thornton and Margaret comes precisely at the half-way point of the book. The remaining two hundred pages of the story reveals a softer, meeker Margaret in relation to Thornton. She is jolted into taking a closer look at the man behind the master's mask. Thornton is too bitterly jealous to really see a softer and repentant Margaret. But wait, isn't there still bristling friction between these two passionate people throughout the second half? Yes, of course. But it no longer stems from any perceived ideological or character differences. Outbursts in this portion of the drama erupt not from an indignant Margaret but from an emotionally tortured Thornton, who simply cannot control his bitter jealousy. The potent tension between Thornton and Margaret after the failed proposal is the result of repressed passions and the accumulation of misunderstandings. The unfortunate havoc wrought by Frederick's appearance convinces Thornton that Margaret loves another and causes Margaret to believe Thornton could never love a confirmed liar. The mistaken belief that they are despised by the other costs both of them almost two years of unnecessary suffering. This is wholly romantic tension, which has nothing to do with socio-economic conflicting opinions. And it is not resolved until those final pages (or the illustrious train station scene), when their pathetic illusions dissolve in the glorious light of reality. The very last page has playful arguing between the lovers -- perfect. Was it Love at First Sight for Thornton? Valentine's Day has come and gone, but I'm still thinking about the celebration of romantic love. It's the perfect reason for taking a closer look at the dizzying emotional whirlwind we call "falling in love." Eros is that that form of love that can make mature adults suddenly feel like awkward teenagers and send perfectly rational people into frenzies of mildly insane behavior. Was it love at first sight for Thornton when he met the Southern girl from Helstone? Something definitely happened in those first few moments of being in Margaret's presence that rocked the mill master's world. The book's first meeting between John and Margaret may seem dull compared to the explosive action in the BBC's version of North and South, in which the vicar's daughter plays the moral hero against the onslaught of violence erupting from the cotton factory's CEO. But if you take a closer look at Gaskell's narrative, the scene she wrote is far from dull. Although Margaret is wishing her father's Milton contact would leave so she could take a nap, there are some internal fireworks going on inside the Thornton systems that the man can barely contain. Let's take a look at what's going on with Thornton. He's taken by surprise the very moment Margaret enters the room: first, because she isn't Mr. Hale (or a little girl) and second, because she is "a young lady of a different type to most of those he was in the habit of seeing." What is is that sets Margaret apart from the rest? What is he seeing? She has a self-composed natural dignity, a straight-forward unabashed manner, a simple yet elegant costume, and a beautiful countenance. All this he notices in a few seconds. 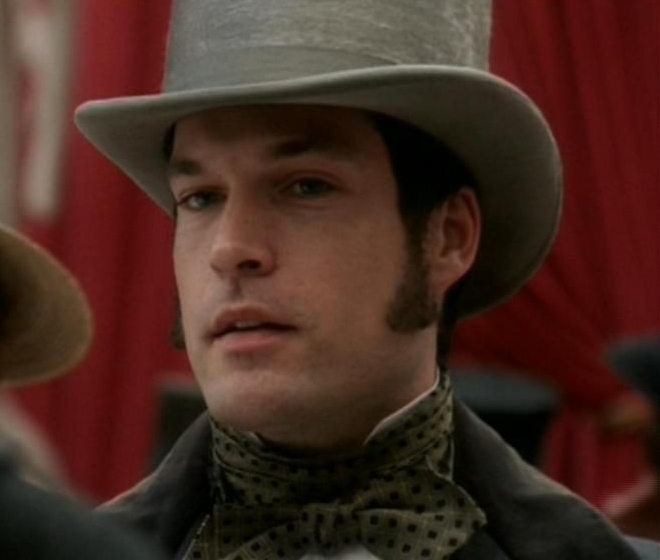 Then Margaret speaks: "Mr. Thornton, I believe." And he can't even formulate a response! "The ready words would not come." He's standing there, staring at her, already tongue-tied. Can you picture this? I hope he at least remembered it's not polite to leave your mouth hanging open! "Mr Thornton was in habits of authority himself, but she seemed to assume some kind of rule over him at once. He had been getting impatient at the loss of his time on a market-day, the moment before she appeared, but now he calmly took a seat at her bidding." He manages to utter something about going to find her father. And as she replies about the house her family intends to take, Thornton suddenly feels that the place he approved for the Hales in Crampton will not be good enough "now that he [sees] Margaret with her superb ways of moving and looking." Okay, so now she at least got him to sit down, but I don't think he's been able to take his eyes off of her. I mean, he's known her for less than two minutes and he's internally raving about "her superb ways of moving and looking?!" I think the man has been gobsmacked. "... her full beauty met his eye; her round white flexile throat rising out of the full, yet lithe figure; her lips, moving so slightly as she spoke, not breaking the cold serene look of her face with any variation from the one lovely curve; her eyes, with their soft gloom, meeting his with quiet maiden freedom." There's only so much that Gaskell can describe while staying within the confines of Victorian propriety, but with these well-chosen words I am imagining Thornton's gaze roving over Margaret's body in a way that is unmistakably sensual. He's watching her lips as she speaks and noticing her bare neck? Whew! But that's not all. If his eyes are sweeping up to notice her throat "rising out of the full, yet lithe figure," I think we can assume he hasn't missed surveying the ample curves found below the neck. Ahem. Go ahead and read that passage again and visualize where Thornton's gaze is lingering. The physical attraction is potent. Yet, it's not merely physical attraction that enchants him. The beauty he sees in her is tied to the qualities she exudes: self-possessed dignity, serene freedom, natural grace, gentle frankness, unshrinking self-confidence and strength. He seems to discern the essence of Margaret Hale in one short occasion. She's a rather amazing blend of both masculine and feminine natures. And Thornton is drawn to her expression of these qualities, so many of which he himself possesses and venerates. So how does this unexpected powerful attraction to a woman impact Thornton? He's thoroughly discombobulated. He can't formulate full sentences in response to Margaret's attempt to make conversation. He's irritated and mortified to recognize that "while he looked upon her with an admiration he could not repress, she looked upon him with proud indifference." He feels inadequate as a match for her and feels resentment rise at the thought that she must look down on him. And when it's time for him to leave, her respectful bow to him makes him feel "more awkward and self-conscious in every limb than he had ever done in all his life before." I love that he exits that scene almost literally off-balance! Even walking is a new sensation when Margaret is in the room. Whether or not his feelings can actually can be called "love" after such a brief encounter, Thornton has all the symptoms of falling for Margaret at their very first encounter. And it only gets worse from him as the story continues. Poor man.